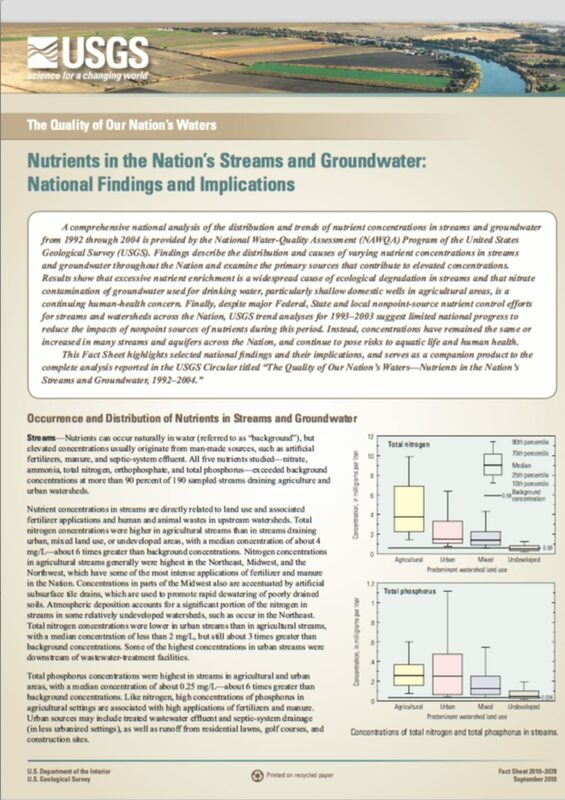 A comprehensive national analysis of the distribution and trends of nutrient concentrations in streams and groundwater from 1992 through 2004 is provided by the National Water-Quality Assessment (NAWQA) Program of the United States Geological Survey (USGS). Findings describe the distribution and causes of varying nutrient concentrations in streams and groundwater throughout the Nation and examine the primary sources that contribute to elevated concentrations. Results show that excessive nutrient enrichment is a widespread cause of ecological degradation in streams and that nitrate contamination of groundwater used for drinking water, particularly shallow domestic wells in agricultural areas, is a continuing human-health concern. Finally, despite major Federal, State and local non-point-source nutrient control efforts for streams and watersheds across the Nation, USGS trend analyses for 1993–2003 suggest limited national progress to reduce the impacts of non-point sources of nutrients during this period. Instead, concentrations have remained the same or increased in many streams and aquifers across the nation, and continue to pose risks to aquatic life and human health.